The Mighty Shandar, the most powerful wizard the world has ever seen, returns to the unUnited Kingdoms. Clearly, he didn't solve the Dragon Problem, and must hand over his fee: eighteen dray-weights of gold. But the Mighty Shandar doesn't do refunds, and vows to eliminate the dragons once and for all—unless sixteen year old Jennifer Strange and her sidekicks from the Kazam house of enchantment can bring him the legendary jewel, the Eye of Zoltar. Over the years, the Troll Wars have taken a terrible toll on the Kingdoms of Britain. All but a few of these fights have been finished in a matter of minutes—trolls, it transpires, are hardy targets—nevertheless countless lives have been lost to this pointless conflict... leading, among other things, to an overabundance of orphans. And what are orphans for if not enslaving, eh? To make matters worse, the Great Zambini immediately disappeared, leaving Jennifer to save Kazam from a fate worse than death... dreaded irrelevance! In The Last Dragonslayer, she did exactly that—then, in The Song of the Quarkbeast, she got mixed up in the machinations of an idiot king. 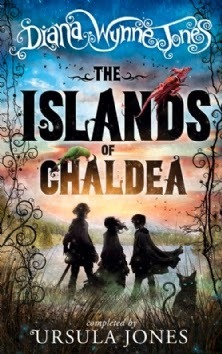 Now, having "saved dragons from extinction, averted war between the nations of Snodd and Brecon and helped the power of magic begin to re-establish itself," (p.3) our ever so patient protagonist—sweet sixteen this year—finds herself in a bit of a pickle. Actually, the problem might be more of a ghost pepper than your typical pickle, because Kazam's actions have attracted the wrath of the Mighty Shandar. One unintended consequence of Jennifer's aforementioned intervention was to make a mockery of the professional pride of the most powerful wizard in the world, who'd been hired, as it happens, to destroy all dragons. Kazam can either sacrifice Feldspar Axiom Firebreath IV and, um, Colin, or do as Shandar demands, and seek out the massively powerful magical artifact known only as the Eye of Zoltar. Which is at least as unlikely as Jennifer's chances of surviving for long enough in the dangerous Cambrian Empire to get to the Leviathan Graveyard (about which no tales are told, because no one's survived to tell them) at the top of Cadir Idris (a mountain so monolithic that its peak has never been seen) where the Eye of Zoltar is said to be stashed. Assuming it isn't a tall tale in the first place. A company, in any event, is assembled. A fellowship of magicians and mere mortals, accompanied—under sufferance—by a put upon princess in a commoner's body currently in the care of Kazam, the better to learn some damned decency. A quest, then? Absolutely not, no! It can't be, in the first for pragmatic reasons—"if it was we'd need to register with the International Questing Federation, adhere to their 'Code of Conduct' and pay them two thousand moolah into the bargain" (p.114)—but also because standard "searches were nice and soft and cuddly and no one need be killed [whereas] a quest always demanded the death of a trusted colleague and one or more difficult ethical dilemmas." (p.327) Needless to say, no one wants that. 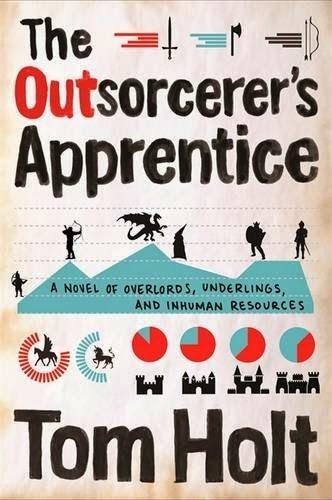 Like the the two volumes of the Last Dragonslayer saga before it—a trilogy in four parts for the foreseeable—The Eye of Zoltar stands as an argument, memorably made, that self-seriousness is not necessarily a necessity in fantasy fiction. Instead, silliness is its stock in trade; a preparedness to poke fun at some of the genre's tritest tropes—as well as itself, I should stress. In this sense its a success. In others... a little less. 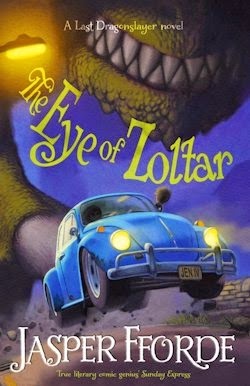 The Eye of Zoltar sadly sidelines a lot of the ideas explored in the series previously, and short-changes several significant supporting characters, not least the Quarkbeast. 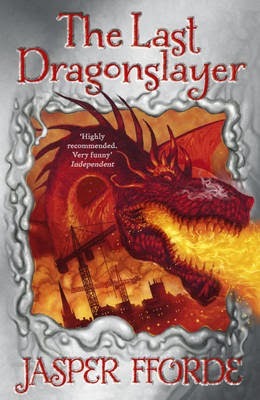 The conspicuous absence of these elaborately established trappings seems to me a clear indicator that this novel need not be; that its primary purpose is not to move the plot along, but rather to rearrange the various pieces in play for the finale of the Last Dragonslayer saga, working title Strange and the Wizard. 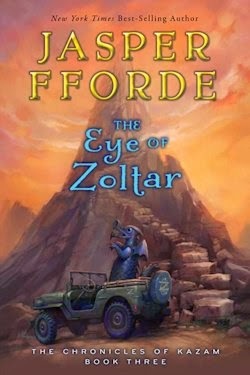 You've got to give it to Jasper Fforde, though. In his practiced hands, even a side story of this sort is almost unmissable—for fans of the man, if not newcomers. It's worth it just for his wit, but there are also wonders in abundance, a mess of marvellous characters—most of whom are new to this book—and a nice, if nominal narrative which strikes a brilliant balance between the saccharine and the smart. The Eye of Zoltar may be little more than a lark, but it's a lark with heart.